Maggie Grey is the editor of Workshop on the Web which is a quarterly online journal of workshops by textile tutors. A review of her CV on Magstitch shows a long career as a textile artist and tutor with more than 10 books in print, numerous international teaching events and exhibitions. A key feature of Maggie’s work is the use of the computer to create textile designs which are transferred onto fabric or other materials and then distorted, stitched, melted, cut or used with a myriad of techniques to change the surface. 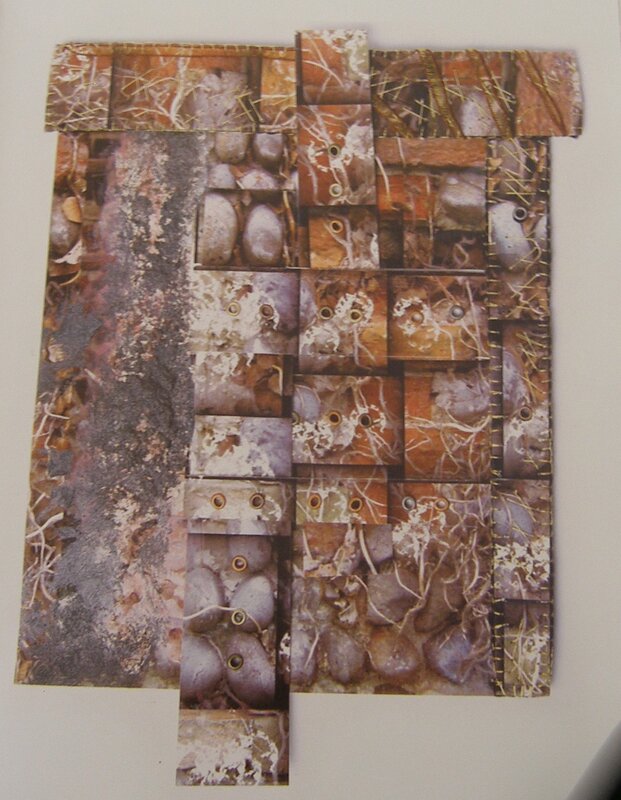 I have one of Maggie Grey’s books: From Image to Stitch which focusses on printing onto paper and fabric and using the result as a starting point for further work. The description is “A digital photograph of a ruined chapel wall was used for this design, printed on heavy watercolour paper. Slits were cut in the paper and a further print was woven through one area. The print was then sponged with black gesso for added texture, and hand stitched. Eyelets were then added”. The eyelets are a contrast in their geometric nature and the evenness of their spacing but the matt metal picks up on the coppery background colour in parts of the photo so they fit in the overall colour scheme..
That stitching or a technique does not have to cover the whole work but can be limited in its application. Maggie’s blog includes free tutorials, one on the use of shrinking plastic and the other called Oiled, Crumpled and Stitched. Oiled, crumpled and stitched gives step by step instructions for taking a printout, photocopy or drawing, crumpling it and then using it as a basis for stitch. I printed the picture onto matte photo paper, then crumpled it. I stitched into it using silk threads, choosing silk because of the sheen that would pick up on the metallic in the photo and the oiled look. I did some French knots in dark blue, running stitch in a brown/bronze thread and chain/detached chain stitch in lavender thread. The I used lavender and green threads to work some areas of overlapping Cretan stitch. I applied a little bit of gold Pearlex powder to the ridges between the gold coloured areas to act as bridges, linking the areas together. Following from the learning point above as to not being limited by existing boundaries, I decided to extend the stitching off the sides of the paper. I mounted the paper on a piece of felt for padding, then onto a piece of bronze coloured silk dupion to pick up the metallic colours. Then I continued the French knots and Cretan stitch from the paper onto the dupion in a few places. Finally I edged the paper with blanket stitch to hold it onto the backing fabric. It was interesting to try a technique that was new to me. Stitching on the paper was tricky as it was easy to tear. Although Maggie Grey says to stitch the paper before mounting the piece on card or felt I would use a felt backing before starting to stitch as this gave more substance and helped stop the paper from tearing. 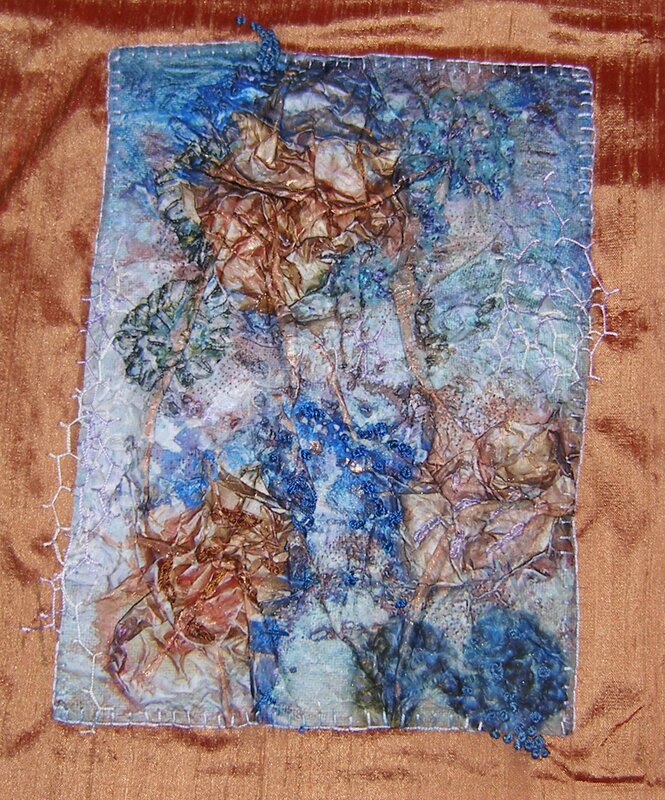 I was also limited by the size of silk dupion I had in the right colour otherwise I would have extended the stitching further, particularly the blue French knots as I liked the way these continued the raised texture into the framing. As well as these tutorials, Maggie quite often includes detailed information on her blog as to how she has created a textile piece. 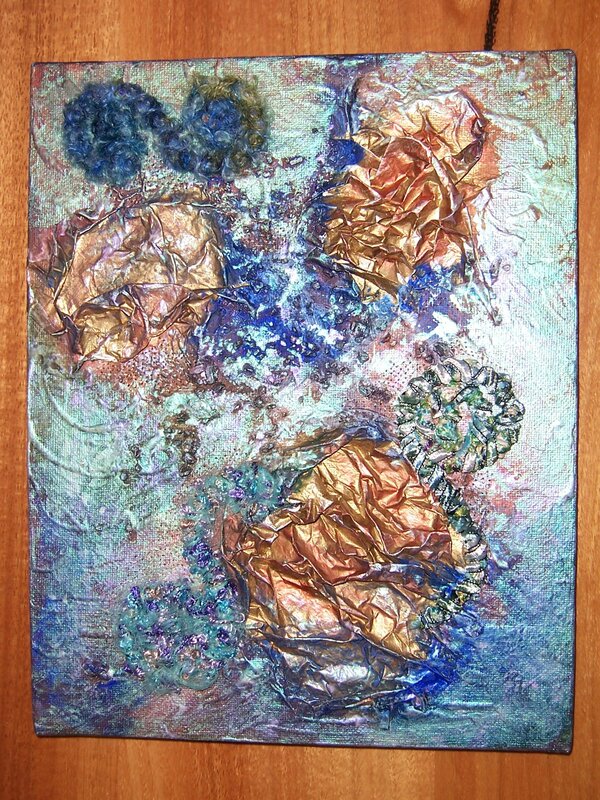 Her Birch Blog series in February 2015 shows how she created a piece of work and includes examples of her initial sampling with making leaves in metal, Vilene treated in different ways, paper and a combination of these techniques. This is interesting as it shows the importance of sampling even to an established artist with years of experience and experimentation behind her. This is an interesting quote and makes a very strong point that having a degree (or other qualification) does not necessarily mean that quality work will be produced. Instead she advocates attention to craftsmanship and concept which can be seen through her work in sampling and exploring different techniques and themes.